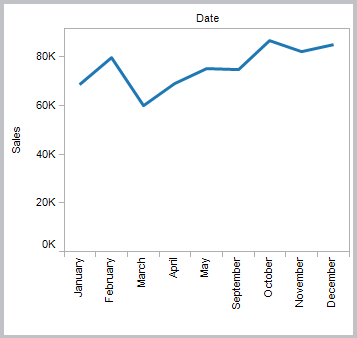 When you’re working with dates or numeric bins, Tableau only shows the values that are represented in your data. If your data does not contain the complete range of values, the missing values will not be shown. For example, your data may contain data for January through May and September through December. However, there was no data recorded for June, July, and August. 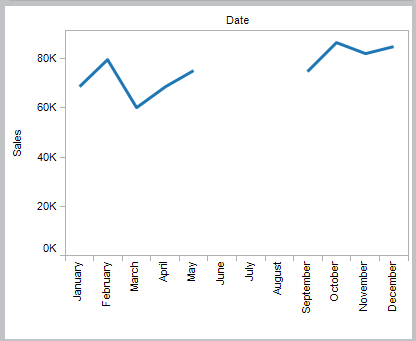 If you create a line chart in Tableau, the missing months will not be shown. You can optionally show the missing months to make it clear that there was no data recorded during that time. Note: You can replace missing values with a calculated field using the ZN() function. See Number Functions for details. By default, missing values in a date range or numeric bins are not shown. 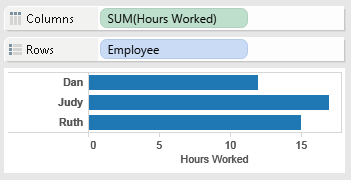 You can show the missing values to indicate incomplete data. To show missing values in a range, right-click (control-click on Mac) the date or bin headers and select Show Missing Values. 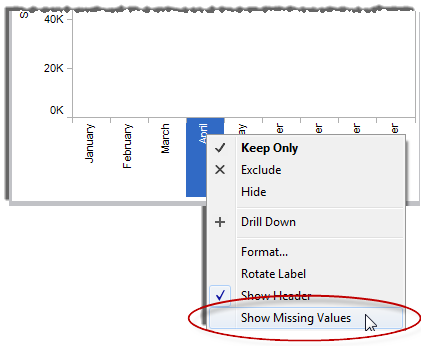 When you are working with fields that are not dates or numeric bins, Tableau hides missing values by default. For example, you may be showing workers and the number of hours worked in a particular month. If a worker didn't work at all that month, there may not be a row in the database for that worker. 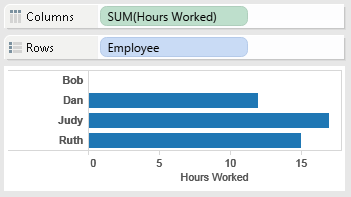 When you drag the Worker field to the Rows shelf, the workers that didn't work are hidden by default. You can show the empty rows by selecting Analysis > Table Layout > Show Empty Rows. Similarly, show the empty columns by selecting Analysis > Table Layout > Show Empty Columns. Bob did not work in January so there are no records in the database for him. By default he is not listed. Even though Bob did not work in January, he is listed but no marks are drawn.